LAW IS A SEAMLESS WEB! This year LawPundit hit an accumulated half-a-million online hits since its inception in 2003. We are thus converting past postings into print form -- and, with some selected exceptions, are removing past online postings, making room for the new things to come. LawPundit 2003-2014 (selected postings) in print is now available for your libraries and professional or personal use at CreateSpace.com, individually by volume as a four-volume printed series titled LAW IS A SEAMLESS WEB (each volume is 326 pages, except for the first, which is 328 pages). Go to https://www.createspace.com/5070319 or e.g. Amazon.com at http://www.amazon.com/Law-Seamless-Web-LawPundit-2012-2014/dp/1502977141. Originally, each volume was priced identically and affordably in terms of $US dollars, but conversions to other currencies may differ because of different publishing dates and other e.g. website variables not under our control. We make no guarantees about pricing, which, of course, is always subject to change -- this is one great advantage of on-demand publishing. Caveat emptor. 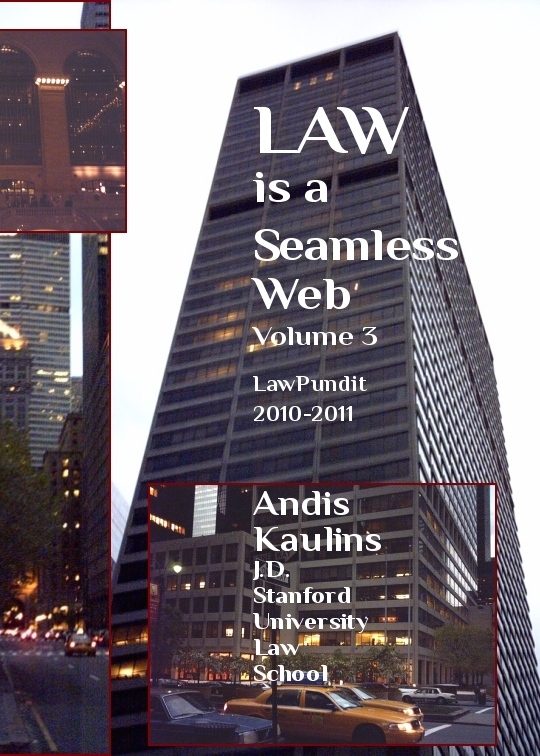 LAW IS A SEAMLESS WEB is also available for Kindle and for iPhone and iTab, whereby we have converted each book page as a graphic for use by the appropriate format -- pages should be resizable as a whole on your device. Online here at LawPundit, for purposes of presentation, we make separate postings for each volume of LAW IS A SEAMLESS WEB. All cover photos were made personally by Andis Kaulins, the LawPundit, on location, except for teaching at Trier Law School (made by a student), and the photograph at the Düsseldorf Opera (made by a guest), from which the profile photos are made. "The here published materials focus on law, legal issues and jurisprudence, including intellectual property (copyrights, patents, trademarks), Constitutional Law, information technology (IT), telecommunications, new media, the Internet, social media networking, politics and current events, personal computers and their spin-offs (smartphones, pads, tablets), sports, travel, the history of civilization, the history of law, cyberspace, and lifestyle. 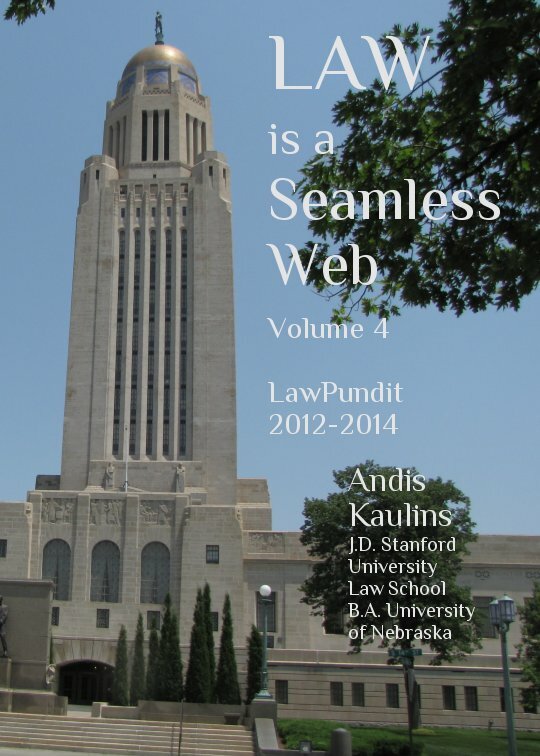 Law is a Seamless Web is a multi-volume publication that contains a wide selection of the "collected wisdom" of LawPundit postings, starting in the year 2003. LawPundit content has been edited substantially for purposes of print and ebook publication. Photographs by the author originally posted to the blog were removed to avoid printing problems and ebook conversion. For legal intellectual property reasons, postings that originally contained too much text material from copyrighted sources were truncated or not included at all. Short quotes from such third parties are included, however, as permissible "fair use". Longer text quotations are used sparingly and involve "public" texts, e.g. court opinions, government documents or sources freely available with attribution (e.g. Wikipedia). Ultimately selected materials concentrate on topics that presumably remain of general or specialized interest over longer periods of time, also beyond the original dates of posting. The initial selections for the print version were checked for the currency of links, substituting current pages or removing dead links as required, but this turned out to be such a gargantuan task that we ultimately abandoned it, since such changes also changed the general content of postings. Many links simply have no permanence. That is part of the ephemeral nature of the digital landscape, even in law. 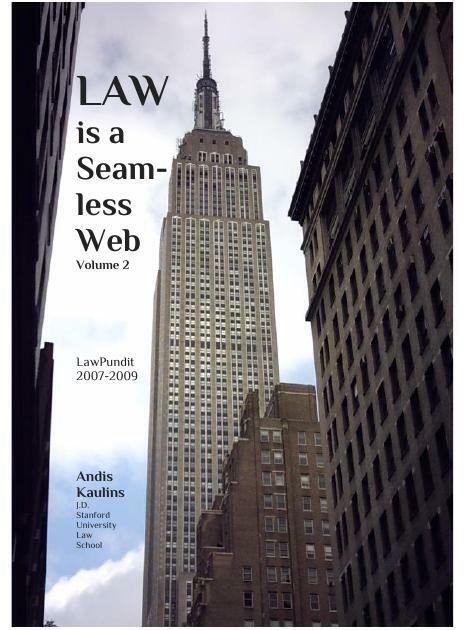 LawPundit is a legal blog, a so-called "blawg", originally hosted at lawpundit.com, that was started in the year 2003 by Andis Kaulins, J.D. Stanford University Law School 1971. The USLaw.com list of "Best Legal Commentary Blogs" recently ranked LawPundit 6th in the Top 10 by quantity of postings, preceding Discourse.net, Jami Floyd: Best Defense, Discriminations and Balkinization, and following Althouse, TalkLeft, The Volokh Conspiracy, Res Ipsa Loquitor, and Prawfs, many of which have multiple authors, whereas LawPundit has only one author." (and also for iPhone and iPad). LawPundit 2003-2014 (selected postings) in print is now available for your libraries and professional or personal use at CreateSpace.com, individually by volume as a four-volume printed series titled LAW IS A SEAMLESS WEB (each volume is 326 pages, except for the first, which is 328 pages). Go to https://www.createspace.com/5024945. LawPundit 2003-2014 (selected postings) in print is now available for your libraries and professional or personal use at CreateSpace.com, individually by volume as a four-volume printed series titled LAW IS A SEAMLESS WEB (each volume is 326 pages, except for the first, which is 328 pages). Go to https://www.createspace.com/4995841. 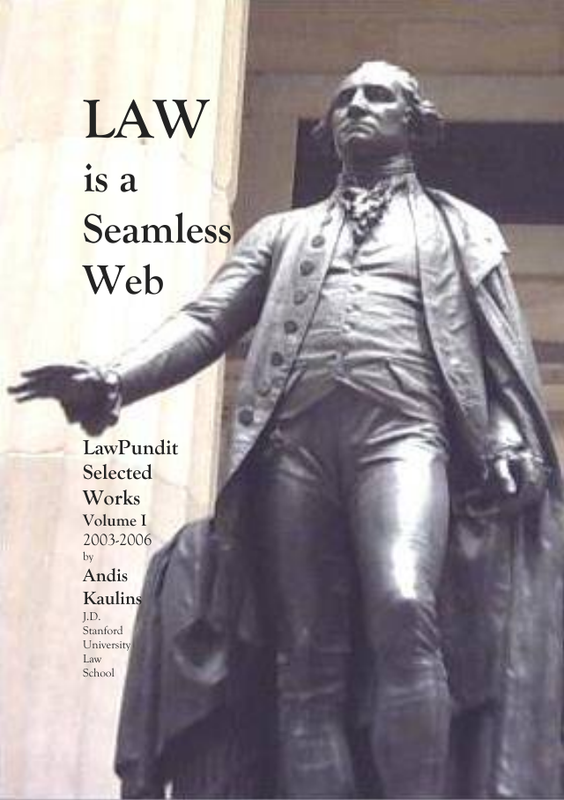 LawPundit 2003-2014 (selected postings) in print is now available for your libraries and professional or personal use at CreateSpace.com, individually by volume as a four-volume printed series titled LAW IS A SEAMLESS WEB (each volume is 326 pages, except for the first, which is 328 pages). Go to https://www.createspace.com/4974386.